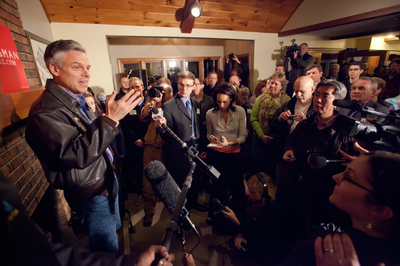 BEDFORD, N.H. — The house on Hitching Post Lane was packed with media and Jon Huntsman fans. Don Byrne, a software executive, stood in a spill-over room with three students from China who were sampling American politics. They were all part of the madness and marvel of a peaking New Hampshire primary season. With just hours to go before citizens cast their votes, candidates make final pitches in kitchens and town hall meetings. Reporters roam in search of any evidence of last-minute surges. Four neighbors who identified themselves as Democrats — the â€œonly onesâ€� in Bedford, they joked — huddled together. One of them, Paul Remus, said he and his wife hosted a house party for candidate Barack Obama four years ago. Admitting that heâ€™s â€œa littleâ€� disappointed with Obama, heâ€™s sticking with the president; his wife may not, he said. Byrne, an independent voter and entrepreneur, hosted a house party for Huntsman in December. He said he likes his realistic approach about what a president can do and unlike other candidates, believes Huntsman can deliver on them. But on Sunday night, Byrne was still undecided as the crowd waited for the candidate to arrive. Torn between Huntsman and Newt Gingrich, he was strategizing his decision. Go with the candidate deemed â€œmost electable?â€� Eliminate â€œthe weaker?" The challenge, said Byrne, was, â€œHow do we use this precious vote we have?" Mitt Romney was not on his list of possibilities. Byrne had brought Chen Zeqing, 22, Ye Fang, 24, and Sun Qianle, 25 — all students at Southern New Hampshire University — to the post-Iowa campaign event where Romney was endorsed by John McCain. Romney, he said, made â€œdisparaging comments about China in front of my friends.â€� At that event, Romney took heat from a Chinese American woman in the audience who asked him not to put Asians down. â€œIt just doesnâ€™t make me feel good,â€� she said. Byrne said the three students he was bringing around to political events were fascinated by the process and anxious to hear Huntsman, a former US ambassador to China. They also wanted to try to talk to him. In the end, both goals were thwarted. From the dining room where they were situated, Huntsmanâ€™s words to the crowd were muffled. When he was done speaking, they tried to get into the kitchen area to get closer to him. As they edged into the crowd, they were swallowed up by something precious indeed — democracy. Matthew Cavanaugh/Getty Images: Republican presidential candidate and former Utah Gov. Jon Huntsman campaigns at house party Sunday in Bedford, N.H.